Canon Yaoundé, from the Cameroonian capital, is historically one of the most successful teams of Cameroonian football. Canon Yaoundé and Cotonsport FC have actually won 10 league titles each before the current campaign. Canon Yaoundé are currently number six in the the MTN Elite One 2010-2011 but from a scout’s point of view, this is one of the most interesting clubs in the league. Junior Lohis Itondo Djoky (born 12.10.1982) is the experienced first choice goalkeeper. The defensive line is centered around wonderboy Maxime Mengue (born 14.04.1992), presented in my post from 30.01.2011, and captain Robert Ntolla Nguena (born 16.04.1985). Mengue is arguably the most interesting prospect in the league at his position. Hervé Guillaume Boumsong (born 13.12.1988), formerly of USM Blida(Algeria), and Jean Roger Eyebe Eyebe (born 02.03.1986) are also important for Canon’s defensive stability. Full-back Pascal Biloa Lebongo has been a revelation this season and is currently part of the Cameroon U-20 national football team. Baba Oumarou (born 04.11.1986), Thierry Onana (born 26.06.1992), a former key player for the Cameroon U-17 national football team, Joseph Marie Gaël Foé (born 10.04.1989) are leading the midfield. Left-winger Boris Ema’a Atcham and striker Fack Bayokolack, both presented in my post from 24.12.2010, and attacker Emmanuel Nlend, are all talented teenagers who have forced their way into the team. 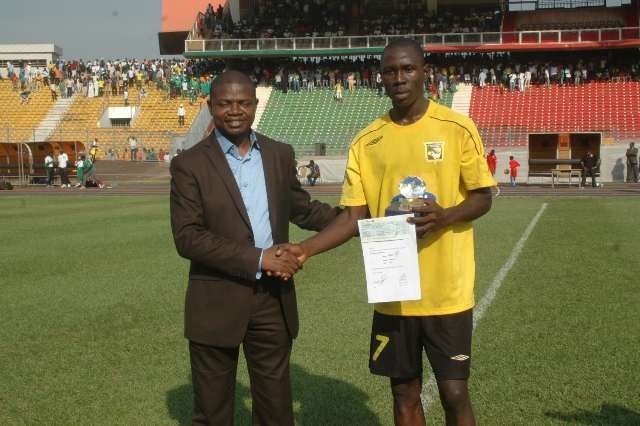 Canon Yaoundé recently brought the highly gifted playmaker Yazid Atouba Emane (born 02.01.1993) to the club. Atouba Emane started the season at Renaissance FC de Ngoumou. The intelligent attacking midfielder will most likely become an essential member of the team, as he is for the Cameroon U-20 national football team. This video shows some of Atouba Emane’s qualities: http://www.youtube.com/watch?v=PlM6N9-QDTI. Otélé Landry Mouangué (born 05.02.1989) is arguably the star striker of the team, and the current top scorer with seven goals. Mouangué is well known in Cameroon for his sharp shooting abilities. In-form Frédéric Nguidjol is currently first choice as the striking partner of Mouangué. Ngaoundéré University FC is a modest team from Ngaoundéré, a rather isolated city in the central parts of Cameroon. The football team is associated with the university in the city, apparently home to about 15 000 students. Many of the players of the team are current or former students at the university. Ngaoundéré University FC, actually a team with a lot of experience, is currently number 7 in the league. Aboubakar Abdoul Aziz is the experienced goalkeeper of the team. Jean-Paul Ekane Ngah (born 28.08.1989), formerly of Espérance de Guider, is a key central defender. Other important players for the club’s defensive line are John William Tanguakou (born 17.11.1984) and Georges Eyidi Banimb (born 23.10.1979). Alain Assana (born 17.01.1986), a towering central midfielder, is the star of the team. Assana was named as the MTN Elite One Player of the month in December 2010. The picture, taken from Camfoot.com, shows Assana receiving the award. Winger Oumarou Herman Mounang is another key player and both Assama and Mounang was part of the Cameroon B national football team during 2010. Attacking midfielder Oumarou Sanda (born 06.11.1982) has a lot of experience from Cotonsport FC. Journeyman Felix Nzeina (born 11.12.1980), formerly of Busan I’Park(South Korea) and Pyunik Yerevan(Armenia), is the star striker of the team and the leading scorer with 4 league goals. Nzeina is a handful for any defence with his strong physique. Nzeina is mostly partnered by Basile Nyaguele (born 16.12.1984), formerly of Astres Douala, Daouda Souaibou (born 20.03.1984) or Serge Abed (born 03.01.1987), a striker with a reputation for scoring goals in Cameroonian football.